The 2017 Canadian UFO Survey is out, and it has some interesting results. But what's more interesting is the reaction of UFO fans. There were 1,101 UFO sightings reported in Canada in 2017, or more than three each day. 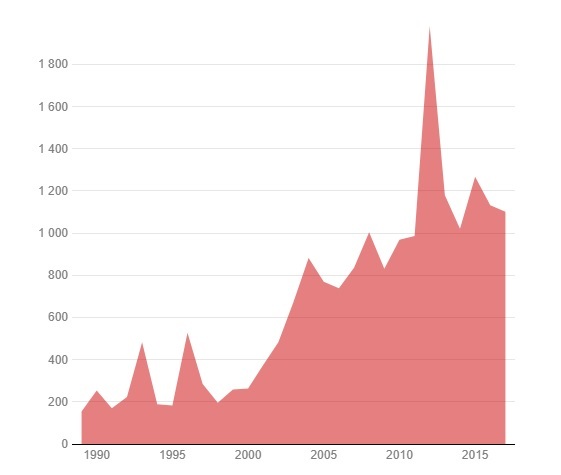 This is the fifth year in a row that UFO reports in Canada are at or above this level. I was actually surprised at this, because the huge pile of reports on my desk seemed to suggest there were more than usual this year. However, that was just an eyeballing of the pile. This year, with the exception of a small number of reports, I looked through, coded, and entered all the data, so instead of having bunches of reports at data processors, I had them all, for the first time in a number of years. 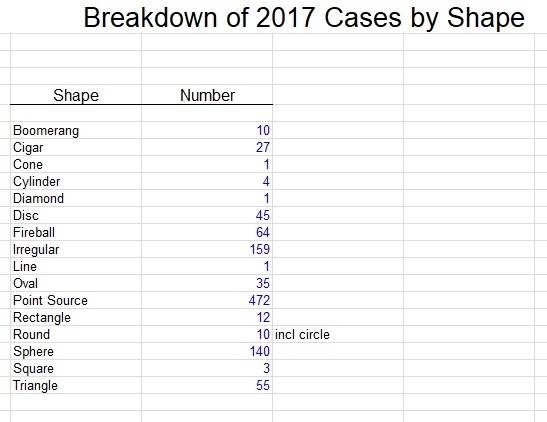 The data itself, the huge list of UFO reports from 2017, is here. It was converted by Geoff Dittman into a PDF and put up online on the Survey website. Quebec had an all-time record high number of UFOs reported in 2017, with 518 reports, up from 430 cases in 2016. In comparison, Ontario had 241 reports, BC had 128, and both New Brunswick and Nova Scotia had 27 cases each. There were even two reports from Northwest Territories and three from Yukon. The result reflects the continuing trend of UFO report numbers following a population distribution. The higher the population density, the more people to potentially be able to see and report a UFO in the sky. But 2017 had a significant anomaly. The fact that Quebec had the highest number of sightings may appear strange, but that province currently has the most efficient UFO reporting websites and its groups have a very public presence. UFO groups there also have regular and frequent TV appearances and public workshops on the subject. Also, the Quebec overrepresentation of UFOs is partly due to a bright fireball late in 2017 that was seen by dozens and dozens of people and reported as a UFO. There is an overall average of two witnesses per UFO sighting. This is often overlooked as being insignificant, but it's actually very revealing. It means that most UFO sightings are not simply something seen by a lone person out for a drive, but there's someone else in the car who also sees the UFO. It attests to the reality of the event. One person was not simply hallucinating. This average number of witnesses declined a bit last year. The actual number was something like 1.7, down from previous years where it had been closer to two. So we are getting more reports from individuals. This may reflect a trend where people are more willing to go on record as seeing a UFO themselves. Perhaps this is a sign of the times, that the stigma of seeing a UFO is lessening. The typical UFO sighting lasted approximately 15 minutes in 2017. 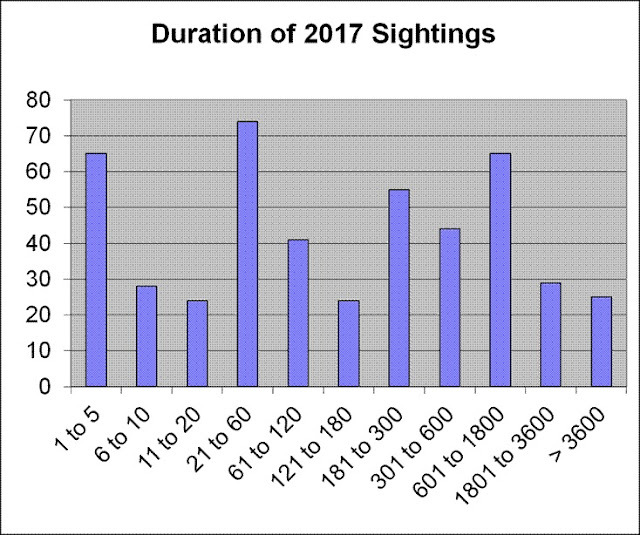 This duration varies slightly from year to year, depending on whether there were more short-or long-duration events reported, obviously. Duration is a good indication of possible explanations for reported UFOs. This is because short-duration events of only a few seconds are almost always things like meteors or bolides. Reports where the object seen was observed for in excess of about 30 minutes (in some cases hours) are inevitably stars or planets. It's the ones with durations of about a minute to several minutes that are the most interesting. That's long enough for a witness to get a good look at the UFO and note characteristics that would rule out aircraft, satellites and whatnot. The study found that 43 per cent of all UFO sightings were of simple lights in the sky. Witnesses also reported spheres, cigars, and boomerangs. I'm still trying to decide how to group these better. A diamond is a tilted square, for example. Boomerang includes V-shaped objects and chevrons. Is a round object a sphere? Did the witness mean a Frisbee? Cigars can also be cylinders. The large number of point source UFOs include those that some witnesses describe as "orbs," even though there's no way a witness can determine if a distant light is spherical or not. Most reports of distant lights moving in the sky are point sources, and when a witness uses the term "orb" it's usually because he or she is a UFO fan and is using the term as convention. UFOs that turn out to be Chinese lanterns are very often called orbs, but of course are not spherical. In 2017, about eight per cent of all UFO reports were judged unexplained. This percentage of “unknowns” falls to less than one per cent when only higher-quality cases are considered. This was what everyone wanted to know. How many reports are "real UFOs?" This is where we get into trouble. Is eight per cent too low or too high? Why are half the reports labeled as Insufficient Evidence? Because, quite simply, few reports are adequately or fully investigated. This can be debated by UFO groups, but let's face it, Canada is a huge country, and well-trained UFO investigators are few and far between. In a large urban area like Toronto, sure, regional reports can be followed up. But a case in Wawa? Likely not. Saskatchewan? Not at all. It should also be noted that the data points for Conclusions were set through a review of available information on the reports. Obviously, case investigation reports on file with specific UFO organizations are not available for review, but in some instances, we know that there has been detailed investigation and analyses, so that helps decide if something is a high quality report and allows a categorization of Unexplained or Possible Explanation, or whatever. If witnesses' statements are available, that helps. If there is an indication that official investigators were involved, even better. But if all we have is a one-liner that an anonymous witness says an orb flew over him at high speed, it's not high on the Reliability or Strangeness scale. While media coverage of the 2017 Survey results was overwhelmingly positive, it's the ufology community that was the most critical. The very first comment I saw in a UFO Facebook group was something along the line of "Rutkowski is just blowing steam. Nothing of substance. He has no idea what people are seeing." To which I respond: "Hunh?" Then there were some who were offended that I didn't include their sightings among the High-Quality Unknowns. Even if all they actually saw were lights moving in the night sky. The debunkers took up the gauntlet of focusing on the 10 High Quality Unknowns as a challenge to explain them away, so that there were no Unknowns left. 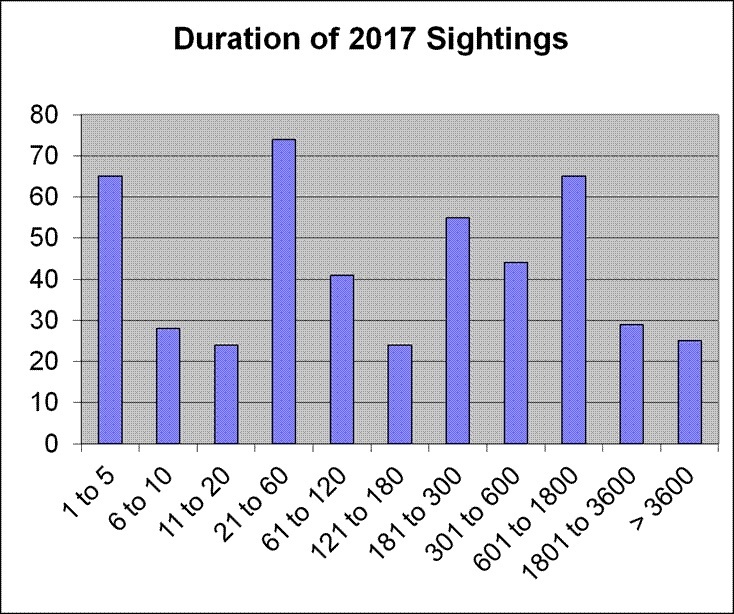 But overall, the 2017 Survey was acknowledged by most ufologists as a good effort to try and understand what Canadians had seen last year. And really, that's all it is. I started out by wondering, back in 1989, what a national overview of UFO reports might look like. There were many groups with their own collections of reports, but no one had tried to gather them all together. So I contacted all the active UFO investigators and researchers in Canada that I knew about, and asked them to help in my study. The annual Canadian UFO Survey started simply as a way to count how many UFOs were being reported, and how the reports were distributed across the country. 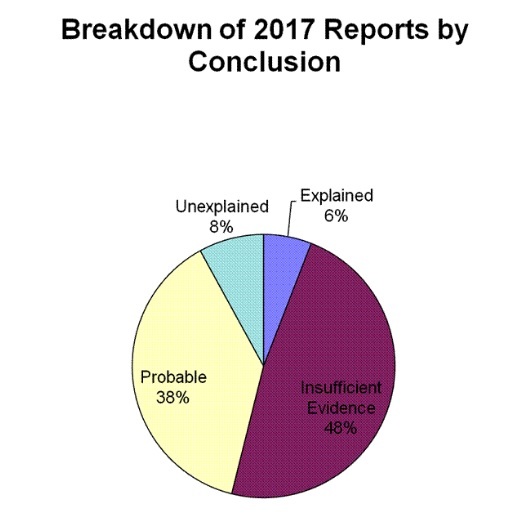 There were also some objections from people who "know" that there were more UFOs seen than reported, therefore the Survey is inaccurate. In a sense, that's true, because polls, including one organized by Geoff Dittman and myself, found that only about 10 per cent of UFO witnesses actually report their experiences. I've made it clear many times that what the Survey looks at is what people report as UFOs. Whether they file an official report with a government agency or simply fill out an online UFO report form with one of several major UFO groups on their websites, the witness is reporting seeing a UFO. Not that they've seen an alien spaceship, only that they report seeing an unidentified flying object. Again, what the Survey measures is what witnesses report as UFOs. And what UFO organizations list as UFO reports on their websites.Even the Canadian military files sightings of UFOs by civilians and troops as "UFO Reports." Soon after I began collecting UFO report data, it made sense to include data points for shapes, colour, duration, etc. And since no other country was doing this systematically in a similar way at the time, it was viewed as a way to develop a tool for understanding the UFO phenomenon. Also, I thought this could be a way to compare Canadian UFO data with other UFO data sets, including Blue Book and others. And so, after nearly 30 years, we are approaching 20,000 Canadian UFO reports on file during this period. Blue Book operated between 1952 and 1970, about 18 years, and it collected about 12,000 UFO reports worldwide.